Decided to give Beaver another go after a week or so off. This lake has been burning a black hole in my dreams ever since I met a fellow angler (Roger) on our way back at the launch to call it a day. I showed up empty handed and he promptly asked if I minded taking a picture of his catch for the day with his son. low and behold he looks like he is weighing in at the classic finally as he pulls out a pair of pigs, 6.5lb and 8.5lb largemouth. needless to say I was slightly jealous I was on the wrong end of the camera that trip. Congrats Roger! So back to my weekend. Started off about the same. I had things going on all day Saturday which burned me because I knew with the week long hot streak and the cold front pushing in late Friday night that conditions wouldn't get any better. And my friends let me know about it. First two pictures are my buddy who hooked up on that 2.5lb cage fighter pretty much right out of the gates after launching. That one stung cuz I knew there were more to come. About 5 minutes after he sent that picture another fishing buddy calls me, he is on his 12th bass of the morning (not on the same lake, he was bouncing around Arlington lakes). Thanks for letting me know how awesome the fish were biting! While I sat there ruing the day away not but an hour later my phone buzzes again, do I dare look? Curiosity got the best of me and I peeked, it only took me a second to start cussing. Here in front of me was that 6+lb hog outta beaver. I couldn't handle it anymore and decided I had to go out Sunday for sure, but low and behold I had the old Honey-do list things to bash out before going and a trip down to the Zoo. That's fine, I'll hit the evening bite and it even started clouding up towards 4-5oclock so I'm thinking things are looking my way! To make this really long story not drag on forever more we ended up spooking a giant, nay an absolute monster bass in a group of sticks suspended away from the shore line and just as we were about to call it quits I had this little spunky male (Weighed in at 1.60lbs on my new digital fish gripper scale) destroy my watermelon w/ red n black flake senko (fished weightless). He actually hit is once, hard, jolting my line through the water directly into a pile of sticks, of course I fubared the hook set on the only bite and quickly got my senko sent flying back to the boat. I reeled up and tossed her in again just to the left a bit. With no tap, hit, jerk, or bump my line just started immediately meandering off to the left. I let it go about a ft or so and gave it the old bass pro hook set, ensuring that my failure would not be repeated. my rod doubled over (ugly stick w/ 8lb mono) and fight was on. I wasn't loosing this one so I played it around a hair and then just flipped it up and in the boat. Quick pic and measurement and back to the black water he went. I'll try to shorten up my future reports, I tend to get carried away. Tight lines guys! hope the bass continue heatin up. View other reports from Jerome716. Nothing wrong with chomping at the bit to get the season started and it's just getting started! This last warm up made it official and it won't go back! What Arlington area lakes are open aside from Bryant? Great little lake, but I'm curious...any idea if those hogs are going back in, or are they being hauled out of there? Be a shame if they're coming out. A lake that size can't be holding many of them! 8theB8- Thanks man, fyi- im a big fan of your reports.. now that we got that out of the way lol, My buddy fishes a couple of private ponds in Arlington but most of his catches on Saturday were from Sunday Lake there in Stanwood (I believe?). 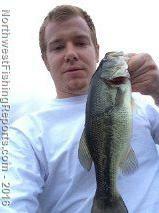 He catches mostly mini bass outta there but hooked up on a few 2-3lbers. Hope to catch you out on the lake sometime. Dutchman- Most definitely all bass are released after a quick measurement, picture and a kiss (if you're into that sorta thing) :) gotta keep those big ladies in there to make big babies right? I haven't seen too many people on the lake haul any bass out, but I do tend to see reports where someone has a picture of a hog on a cutting board... darn shame if ya ask me. Appreciate it! Yep, Sunday is a dink factory for sure, good place to take a kid or newbie, same with Loma. Good job on Beaver by the way! That lake can be a tough nut with those floating mats but man are there some toads in there! Is the launch still partially blocked or did that island mat blow back out? May have to wait until things dry up a bit and mash it down with trucks?! That side was always a bit soft. What do you launch on Mud Lake, that launch reminds me of Lake Connor out by Machias, easy in, PITA out! Cool little lake for sure though and very unpressured fish! The mat seems to have moved more over the launch than last time I was there according to my buddy who went this evening. Might have to coordinate that truck mashing here soon lol. Unfortunately for me the only boat I have is a little 12ft aluminum V-bottom row boat, therefore I launch that into Mud... yeah, it's a B.... getting in is easy, getting out is a struggle lol. I always have super high hopes that Karma will reward my efforts, which isnt always the case lol but for the most part I do pretty well there. Like you said they are very unpressured fish so they strike most anything and strike it hard. Makes for a good trip. Makes me like the "Launch" being the way it is so it stays secluded.